It was a positive blue Monday in Telford this week as Arriva Midlands launched a new fleet of vehicles for the 481 route linking Telford with Stafford. The six blue liveried Wrightbus VDL single-deckers will provide additional capacity to support the continued growth of patronage on a route that has already seen frequency increases and vehicle upgrades in the recent past. Telford’s MP, David Wright, was the guest of honour at the launch event held at The Telford International Centre, joining Area Director West of Arriva Midlands, Rob Cheveaux, Telford and Wrekin Councillor, Hilda Rhodes, and the head of transport at Telford and Wrekin Council, Keith Harris, to formally unveil the vehicles to the public. Speaking with Rob after the formal launch, he indicated that customers on the 481 could expect further improvements in the coming months. Already considered the most reliable and fuel efficient vehicle type operated, the new vehicles are to be fitted with the Econospeed dynamic throttle control system to increase comfort, economy and environmental performance. This works by restricting the maximum rate of acceleration to encourage careful and economical driving. A programme of customer care training was also planned for the driver teams at the relatively recently opened new depot in Telford. This facility replaced the former Midland Red premises in Wellington, designed in days when vehicles were no more than 8.5m long! 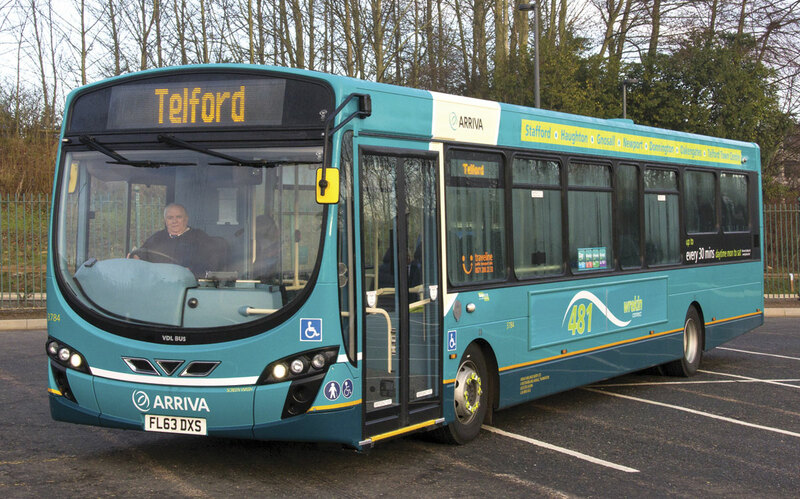 It provides significantly improved working conditions for the staff operating Arriva’s comprehensive and predominantly commercial network in the Telford area. Arriva have also taken over operation of the enquiry office in Telford’s town centre bus station. 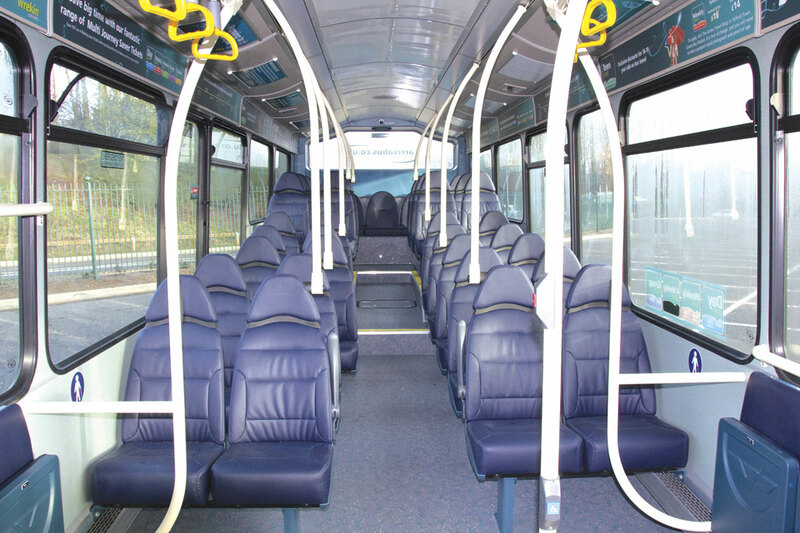 The new Wrightbus VDL vehicles represent an £870,000 investment and feature low-emission engines, CCTV, E-leather seating and LED lighting together with buggy and wheelchair areas. Five of the vehicles are route branded for the 481 and carry the Wrekin Connect branding applied to services operating within the area of the Telford and Wrekin unitary authority. 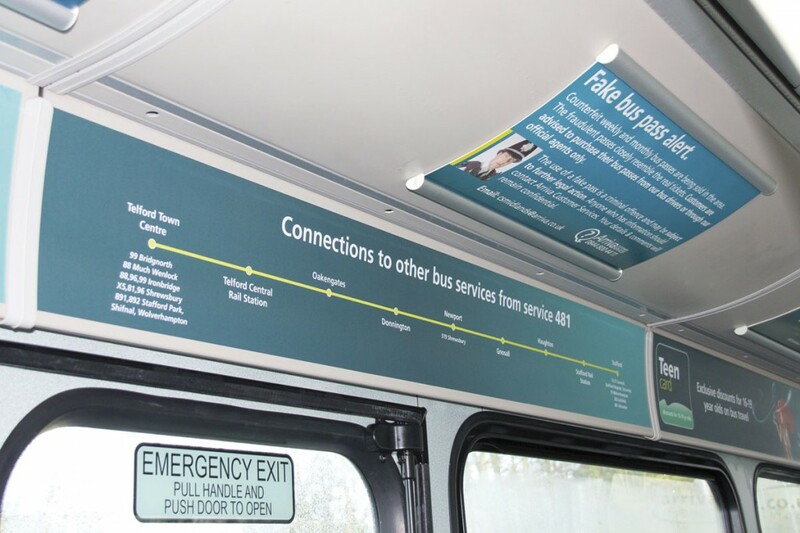 The branding is carried through to internal posters that also show where the 481 connects with other Arriva services. 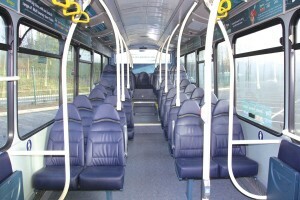 The sixth vehicle is to the same specification but unbranded to allow flexibity in use. Route 481 operates every 30 minutes during the day Monday to Saturday and up to every hour on a Sunday and weekday evenings between Telford Town Centre, Telford Central Rail Station, Oakengates, Donnington, Lilleshall, Church Aston, Newport, Gnosall, Haughton and Stafford. The route’s origins are in separate services linking Telford with Newport and Newport with Stafford. These were combined into the 481 on an hourly frequency and became one of the fastest patronage growth routes across the Arriva network. Growth has been supported by increased frequencies, improved local infrastructure from Telford and Wrekin Council and now the second allocation of new route branded vehicles. The latest vehicles replace lower capacity two year old Optare Versas which are to be cascaded to Arriva’s Stafford operation.